At the moment, the king of movie mutts in Italy and much of Europe is the German shepherd, Rex, star of the joint Austrian-German-Italian TV crime series, Kommissar Rex. The series started in Austria in 1994 and starred Rin-Tin-Tin wannabe, Reginald von Ravenshorst. (No kidding. That was the dog's name. That's not as bad as the real name of filmdogdom's Ur-hero, Strongheart—Etzel von Oeringen!) The plot of the Kommissar Rex series has now shifted to Rome, changed title to Commissario Rex, and since Reggie was getting really long in the canines, the producers have changed pooches, as well. The last I heard, they were using a German shepherd named Rhett Butler (no kidding again!) plus a few other animals as stunt doubles. It's probably a good gig for a dog, but maybe not the best; it is potentially dangerous since some trainer is always trying to get you to leap tall buildings in a single bound. Doing commercials has to be better; the residuals (paid in dog biscuits) go on forever, and you get stroked and scratched behind the ears by beautiful actresses. Not too long ago in Italy, there was a series of ads on television pushing some newest version of a cell-phone. When I first saw it, it made me sit up, roll over, wag my tail, and take notice. First of all, it was in Neapolitan dialect! That was a must, since the dog, itself (really and truly named Ettore [Hector] both on and off camera) was a Neapolitan mastiff (photo insert, above). This droopy, drooling, dewlapped, red-eyed, overly-wrinkled, lumbering version of man's best friend is related to the giant war dog, the Molossus, bred by Alexander the Great to fight tigers and elephants. The books say that the Neo (as it is fondly known to owners) looks "wistful" when relaxed but has a "penetrating gaze" when it is about to rip your guts out for looking the wrong way at its master. They were apparently bred to be as ugly as possible on the theory that a thief on the verge of breaking into your home would think twice about it upon seeing a beast that looks like this. The Neapolitan mastiff was on the verge of extinction, but since World War II has been making a comeback due to diligent breeding. In the cell-phone ads set in Naples, Hector was always in the company of a beautiful young woman, where he dispensed a world-weary running voice-over (in Neapolitan, of course) on the futile efforts of young men to hit on said babe, his mistress. These problems, he advises, can be resolved only by buying the new Italian Telecom cell-phone that gives you two numbers, call-waiting, color TV, broad-band access to the encrypted Interpol server, and blood transfusions. I recall that Hector made almost a dozen ads like that. In one of them, he even had Sophia Loren as a co-star. The dirty dog. 2. The World's Ugliest Neapolitan - Finally, some real recognition! 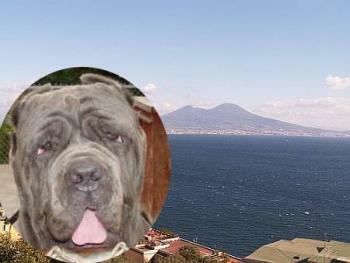 It's hard to tell, but I think that Neapolitan Mastiff, Martha (image), is well-pleased. She has just been declared "the World's Ugliest Dog" at the 29th WUD contest at the Sonoma-Marin County Fair in California. She was the only animal in this year's contest too big to be held by her handler. She was rescued in terrible condition, nearly blind, from a shelter and nursed back to prize-winning health. If that doesn't pluck your heart strings and make you just want to flop down, sigh, and drool for joy, you're hopeless.